This collection of essays includes: THE CASE FOR THE EPHEMERAL, COCKNEYS AND THEIR JOKES, THE FALLACY OF SUCCESS, ON RUNNING AFTER ONE'S HAT, THE VOTE AND THE HOUSE, CONCEIT AND CARICATURE, PATRIOTISM AND SPORT, AN ESSAY ON TWO CITIES, FRENCH AND ENGLISH, THE ZOLA CONTROVERSY, OXFORD FROM WITHOUT, WOMAN, THE MODERN MARTYR, ON POLITICAL SECRECY, EDWARD VII. AND SCOTLAND, THOUGHTS AROUND KOEPENICK, THE BOY, LIMERICKS AND COUNSELS OF PERFECTION, ANONYMITY AND FURTHER COUNSELS, ON THE CRYPTIC AND THE ELLIPTIC, THE WORSHIP OF THE WEALTHY, SCIENCE AND RELIGION, THE METHUSELAHITE, SPIRITUALISM, THE ERROR OF IMPARTIALITY, PHONETIC SPELLING, HUMANITARIANISM AND STRENGTH, WINE WHEN IT IS RED, DEMAGOGUES AND MYSTAGOGUES, THE "EATANSWILL GAZETTE", FAIRY TALES, TOM JONES AND MORALITY, THE MAID OF ORLEANS, A DEAD POET, and CHRISTMAS CONSIDERED. According to Wikipedia: "Gilbert Keith Chesterton (1874 - 1936) was an influential English writer of the early 20th century. His prolific and diverse output included journalism, philosophy, poetry, biography, Christian apologetics, fantasy and detective fiction. 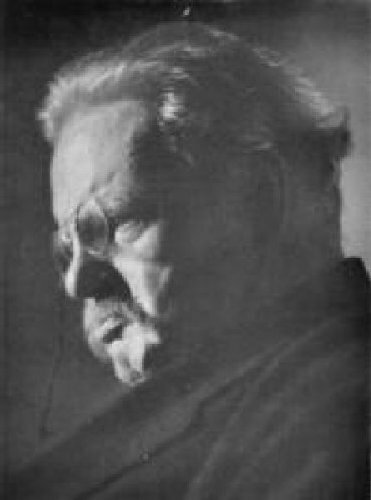 Chesterton has been called the "prince of paradox." He wrote in an off-hand, whimsical prose studded with startling formulations. For example: "Thieves respect property. They merely wish the property to become their property that they may more perfectly respect it." He is one of the few Christian thinkers who are equally admired and quoted by both liberal and conservative Christians, and indeed by many non-Christians. Chesterton's own theological and political views were far too nuanced to fit comfortably under the "liberal" or "conservative" banner."